July is National Hot Dog Month and the 4th of July is traditionally a big day for hot dog consumption. Wienerschnitzel's newest dog is the "Angus Chipotle Chili Dog"!! Sure to give McDonald's Angus Third Pounder a run for its money! btw, National Hot Dog Day is a little later in the month, July 18th. Krystal's is wrapping up their celebration of National Hamburger Month with “The Krystal Giveaway Show." It is a live, streaming online video event that will take place Wednesday, May 27 from 10:00 a.m. to 4:00 p.m. EST. The Krystal Team will be broadcasting live, where they will be asking the online audience to answer trivia questions and complete challenges. There will be more than $1,500 in prizes, including $100 Krystal Gift Cards and loads of Krystal goodies. The event will be broadcast live from the Krystal "3D" (Drive-In, Dine-In, Drive-Thru) restaurant in Chattanooga and you can watch it live at NationalHamburgerMonth.com. You can also follow along on Twitter and Facebook for $50-A-Day-Giveaways. Laughing Squid has a great little post about White Castle & Krystal, The War of the Tiny Hamburgers: North vs. South. The post has some great restaurant photos of the 2 purveyors of tiny hamburgers and the tiny hamburgers themselves. As you can see from the map below (that I've modified from the one at Wikipedia), White Castle's market is in the North and Krystal's is in the South. The only 2 states with both restaurants are Kentucky and Tennessee. And as Laughing Squid points out, "One thing is certain, the West Coast is missing out on all of the tiny square hamburger action." 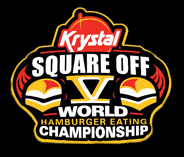 Krystal Square Off V World Hamburger Eating Championship is coming soon. Qualifying rounds are already underway. Krystal's 5th annual hamburger contest will take place in Chattanooga, TN on September 28, 2009.
miss the 2007 Square Off, leaving the door wide open Joey Chestnut who ate 103 of Krystal's little square burgers. September 21 in Memphis, TN. The 1st place prize is $50,000. By the way, a Krystal burger weighs 60 grams and has 160 calories, 70 calories from fat, 7 grams fat, 3 grams saturated fat, 20 mg cholesterol, 260 mg sodium, 17 grams carbs, 1 gram fiber, 1 gram sugars, and 7 grams protein. So 103 burgers (last years winning amount) would have 16,480 calories and 721 grams of fat (or 1.6 pounds of fat). That's the calorie equivalent of 59 McDonald's hamburgers, 38 McDonald's Quarter Pounders, 59 Burger King Whoppers, 40 Wendy's Classic Single with everything, 17 Jack in the Box Ultimate Cheeseburger, or 78 Subway 6-inch Turkey breast subs. New Salads from Carl's Jr.